Some events are closely associated with certain imagery. There are a lot of pumpkins around Halloween, a decorated tree on Christmas, lots of fireworks on New Year's Eve and, of course, the Apple Store goes down every time there's a new Apple product coming. 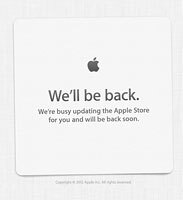 The Apple Store is down! Unless you've lived in a cave for the last month, you'll know that today Apple will be launching the next generation iPhone (likely to be called iPhone 5). By the way, this isn't a technical issue, it's just an Apple tradition and a way to generate some extra buzz before the event starts. 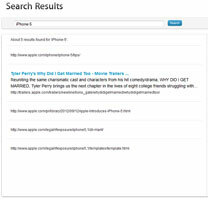 While the Apple Store is down, mentions of iPhone 5 have cropped up in the search results on Apple's site. There are four such results at the moment, including the telling "http://www.apple.com/pr/library/2012/09/12Apple-Introduces-iPhone-5.html". Also, how about this "iPhone LTE" page - it either confirms what the rumor mill has been saying or it's a troll on Apple's part (unlikely). Of course, all of those links lead to missing pages, but they'll go live as soon as the official announcement takes place later today. There will be a new iTunes too and perhaps a couple of new iPods as well - an iPod Touch and iPod nano. The S3 is one of the ugliest phones on the market. FACT. I have an Samsung S3, Apple software and Hardware does not even compare. On Looks alone, S3 outsells all.